Photographics to capture their important moments in time. Lynn and Kim are amazing photographers to work with – from beginning to end. We first met Lynn for our engagement photo session, and as soon as we met her we knew we had made the right choice! Her professional, yet fun, approach to her craft allowed us to be ourselves and this is reflected in all of our engagement photos. When we found out that both Lynn and Kim would be shooting our wedding we were thrilled – we knew the day would be made that much more special having these ladies capture all the wonderful moments. Their attention to detail, such as patiently fixing my hair as the wind continued to mess it up, their artistic eye that can see the perfect photo before shooting it, and their enthusiasm for what they do definitely made it easier for us to relax and enjoy our wedding day, knowing that these photos would be the keepsakes we would treasure forever. Every aspect of working with these ladies was done in such a relaxed and professional manner that you knew you were dealing with some phenomenal people. Thank you Lynn and Kim for celebrating our day with us and for creating the perfect way to remember it over and over and over! “My now husband and I are probably not the easiest people to photograph as we both tend to shy away from any camera. That being said, Lynn made it a very enjoyable and fun experience for us. Lynn has a very soothing way about her, her smile is contagious and she fit in so well amongst our friends & family that some didn’t even realize she was our photographer. Lynn was very well prepared, she drove up to Jasper the day before our wedding and scoped out various locations for us so all we had to do was show up and smile. Above and beyond that, she has an amazing eye – not only was she able to take beautiful pictures of the majestic mountain landscapes (and do them justice which is not an easy task!) but she was also able to make us look great! At the end of it all, we get to keep the most amazing wedding album. The layout is stunning and tells our story perfectly. Everyone who has seen the album has been very impressed and most of their comments have been "wow I wish my album looked like this!" The mini-albums were also the perfect gift for our parents & grandparents. Our experience with Kim, Studio 9 was nothing short of fantastic! Their quality of photography is not only superb, but their calming and unobtrusive presence during the wedding day allowed for a relaxed environment (making for a happy Wedding Party!). We were both thrilled with not only the experience, but also with the amazing photo album that Studio 9 prepared for us – it is a valuable keepsake that we will treasure forever. We chose Studio 9 for our wedding and engagement photos because they came highly recommended and the work showed it! Lynn made us feel very comfortable and very at ease. She came to Red Deer and endured mosquito infested swamp land to get the perfect engagement shots and then on the wedding day stayed with us from the morning getting ready to the bouquet toss and then some. The pictures turned out better then I could have ever hoped for and we could not be happier! Thank you so much Lynn for helping to make our day so fun and memorable. 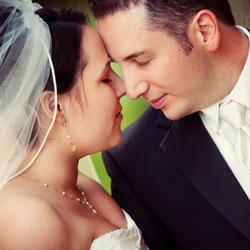 We are so glad that Studio 9 was by our side gathering all of the memorable moments on our wedding day. Our engagement photo session was just what we needed to get comfortable in front of the lens and it allowed us to get to know Lynn and her style a little bit better. We were pleased that she was able to capture the essence of us as a couple in a unique way. We were also very impressed by the way Lynn worked and photographed our wedding party of 14 people so effortlessly. We had a wonderful experience with Studio 9 from our very first meeting to the beautiful end result. We couldn't have asked for anything better! 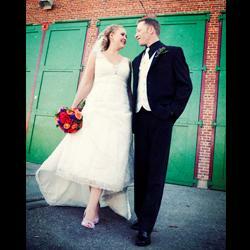 We could not be more thrilled with all that Kim, and everyone at Studio 9 Photographics did to capture our wedding day. Finding the right photographer was one of our top priorities during all of the wedding planning and it took no time at all for us to know that Kim was the perfect choice. 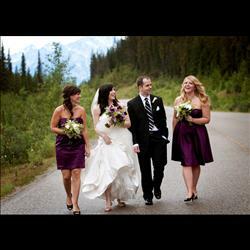 They made working with our large bridal party and group seem effortless making everyone smile, laugh and look our best. Their attention to detail and creative vision for wonderfully unique shots has not only left us with a stunning album but with works of art that will adorn our walls and be cherished for generations to come. Because of their warmth and amazing spirit, we are proud to say that they are more than our photographers… they are part of our family. Thank you so much! Lynn and Kim possess a great deal of experience and passion for their craft. 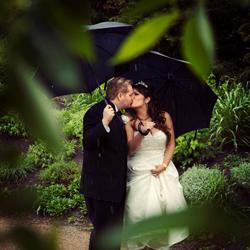 They have a genuine sensitivity towards the emotions that a bride and groom experiences on their wedding day. They got the important portraits and they captured the unscripted moments and emotions that happened on our wedding day that can never be repeated. The album they made for us is a work of art. As we grow old we will relive the magic of the day by looking at each page and will share our album with generations to come. It is our most favorite possession. We purchased the disk of photos as well - hundreds of photos in high resolution – the value of this option is unrivaled in the industry. They also made one-of-a-kind thank-you cards designed specifically for us. Our friends and family still call us to remark on how unique and beautiful the cards are. The expertise of the photo taking on the day, meticulous editing and touching-up, the priceless heirloom album and pictures, and the packaging of the final products - every detail was perfection. Our experience may have started with our wedding day, but we feel that in Studio 9 Photographics, we have found a photographer for all of life’s special moments to come. Lynn and Kim did an amazing job on our wedding photos! But that's not all they did! Not only did they capture all the special and memorable moments, we were completely relaxed and comfortable, making for memories that are natural and classic. On the wedding day, I was worried that the unexpected weather (rain and snow in May) would affect how our photos would turn out, but Kim and Lynn were prepared and their expertise allowed them to adapt to the weather! They came up with so many original ideas for our photos and we (my bridal party) were all so impressed! By the end of it, there was seriously nothing to worry about, and I have the pictures to prove it!